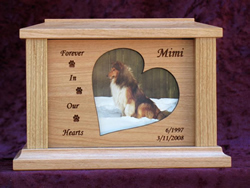 These hardwood pet urns come in three sizes and four wood types and there are five different front photo frame panels. Please choose the panel you want when ordering. All urns include a clear finish showing the natural wood color, glass to protect your photo, and engraving of name and dates. Please specify the location of the engraving (Front Panel, Top of Urn, or Back of Urn) when ordering. To view examples of the Engraving Fonts, click on the tab titled Detailed Images. The urn engraved on top is in the Times New Roman font, the other urn is engraved with Monotype Corsiva. Please abbreviate dates, using only numerals - do not write out the months. Note1: The square front panel is too small to be engraved. Please choose engraving on the top, back, or side of the urn when using the square front panel. Note2: The slanted heart front panel is already engraved with "Forever in our hearts". 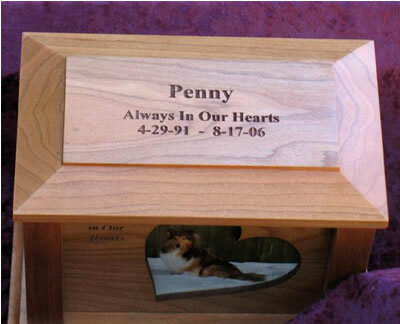 The slanted heart cascade front panel is engraved on the left side with "Forever in our hearts" and paw prints between the words. These urns are unique in that they have a pop-out frame and a hidden opening for inserting the ashes from the front behind the photo frame. To remove the frame, slide the right side of the frame to the edge of the box and lift out the left side. You will see screws holding the hardwood panel. Remove the screws and pull out the panel to insert the ashes. Small: 30 Cubic Inches - large enough for MOST pets with healthy weights less than 18 pounds. Dimensions: 6 1/2" x 4 1/4" x 4 5/8" LxWxH - Picture size: 4 1/2" x 3 1/4"
Medium: 70 Cubic Inches - large enough for MOST pets with healthy weights less than 45 pounds. Dimensions: 7 11/16" x 5 3/16" x 5 1/4" LxWxH - picture size: 5" x 3 1/2"
Large: 120 Cubic Inches - large enough for MOST pets with healthy weights less than 80 pounds. Dimensions: 8 3/4" x 6" x 5 3/4" LxWxH - Picture size: 6 1/2" x 4 1/2"
We cannot guarantee that an urn is the correct size for your pet. Please remember that the cremains must be kept in a sealed plastic bag inside the urn and that plastic bag will take up 5-10 cubic inches of space. The industry rule of thumb for determining volume of pet cremains is 1 pound of healthy pet weight equals 1.5 - 2 cubic inches of cremains. Pet cremains are usually not processed as finely as human cremains so the cubic inch volume to weight ratio tends to be higher. NOTE: It is important to keep the cremains in a sealed plastic bag inside any cremation urn. Usually ships 5-7 business days after order is placed. Ships from the Midwest.